If your dog is six months or older, we invite you to our ten week Beginner class. You will learn proper leash handling, positive behavior modification and corrections. You and your dog will learn heeling, sits, stays, downs, coming when called, stand and finishes. This is the class to help you establish who is walking whom! All Beginner level classes start with a training orientation session the first class of the ten week session. This orientation class does not involve your dog so leave him or her at home until the second week of class. Both Tuesday evening and Wednesday daytime students are required to attend the Tuesday evening orientation at 6:30 pm where you will learn do's and don'ts as well as training theories before introducing your dog to classes. When: We accept up to 30 students, fifteen per timeslot, for this popular class on a first come first served basis. Participants are given the choice between two start times (6:00 and 8:00 p.m.) on Tuesday nights. With two instructors per class everyone is provided plenty of attention. In addition, we offer a Wednesday morning class at 9:00 a.m. Our goal is to help you and your dog be the best team possible but your involvement is key to your own success. We train you to train your dog. Note: we remind you when you are at the facility to keep your leashes tight and don’t let your dog wander. While you may have a well socialized dog other new students may not. Incidental contact may bring out the worst natural instincts in yours or other’s dogs with severe consequences. Be aware of your dog at all times and be a responsible owner! For more information see the club calendar, contact SPDTC at 651-455-2431 or email the Director of Obedience at obedience@spdtc.com. Cost: $100 for 10 weeks. To secure your spot in class you must mail in the completed application along with your check. This class normally fills up one or two weeks prior to the start date. When we receive your completed application and check in the mail we reserve your spot in class. You may also sign up in person on Tuesday nights from 5-7 pm, but post marked applications are taken into consideration first. If it is within two weeks of the start date, please email the Director of Obedience for class availability at obedience@spdtc.com. Refunds: Refunds are not given, however alternate class dates can sometimes be arranged. If SPDTC cancels classes for any reason students will be given a credit on the next block of classes. 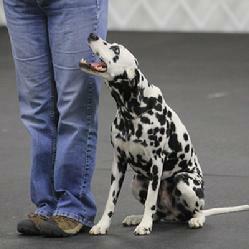 SPDTC offers free advanced classes to anyone interested in helping at the club’s obedience shows. We hold two training sessions a year to familiarize volunteers with the requirements needed to help steward. The class is taught by a judge on a Friday night and lasts about an hour. Students then practice in the mat area helping at our Run-Thru events, at which time your name is placed on our call list. Anyone who stewards will receive a free advanced class of their choice for each show they volunteer their time for plus a free meal. For those that are already stewards we still reward your service with the same entitlements. If interested, contact Obedience@spdtc.com. Our second level is the Intermediate class, which reinforces and perfects what you have learned in the Beginner class. New activities like longer off-leash recalls, stays and more advanced heeling will be added as this ten week session continues. We offer three different timeslots, 5:00 and 7:00pm Tuesday nights and 10:00am Wednesday mornings.